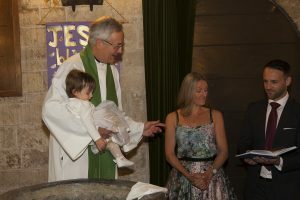 We are really pleased that you are enquiring about baptism (christening) for your baby or child. The first step you need to take is to come along to some of our Sunday services. We do understand that coming to church for the first time, especially with babies or young children, may feel a daunting experience. If you are planning to come along then do give me a call a couple of days before and we will make sure that there is someone to welcome you and put you at your ease. In a baptism service you do make promises that you are a Christian and that you will help your child to grow in their Christian faith until they are old enough to make the decision to be a Christian for themselves. That’s why we ask you to come to church first as it will help you as a family in your journey of faith as you discover and begin to worship God alongside other Christians. If you live in our Benefice, have started worshipping with us for a couple of weeks and are committed to helping your child begin their journey of faith, the next step is for you to come to a ‘We Welcome You’ session that lasts for about 1 ½ hrs. It’s a great opportunity to explore the Christian faith with others in a relaxed environment and also an opportunity to get to know other young families. The Church of England strongly recommends that you should have your child baptised in the parish in which you live. If you are unsure which one that is, then please give me a call and I will help you to find out. It may be that your local church is nearer to you and they will be just as welcoming and friendly to you and your family as those in our Benefice. I look forward to sharing this journey with you – Revd Ros Greenhalgh (Rector) – and can I ask that you complete this contact form below to help you plan your child’s baptism.